When traveling to Japan, you get so many opportunities to experience some truly unique things. Aside from the great food, interesting sights, and incredibly friendly people, there are also activities that you’ll likely not see anywhere else in the world. When I’m abroad, I love to go sightseeing. At the same time, I hate taking public transportation (especially in a foreign country), and even more I hate walking. What if there was a way to take in the sights up close and personal, yet cover a ton of land at the same time? If you don’t mind doing it wearing a costume of your favorite cartoon character, then you should definitely check out MariCAR. 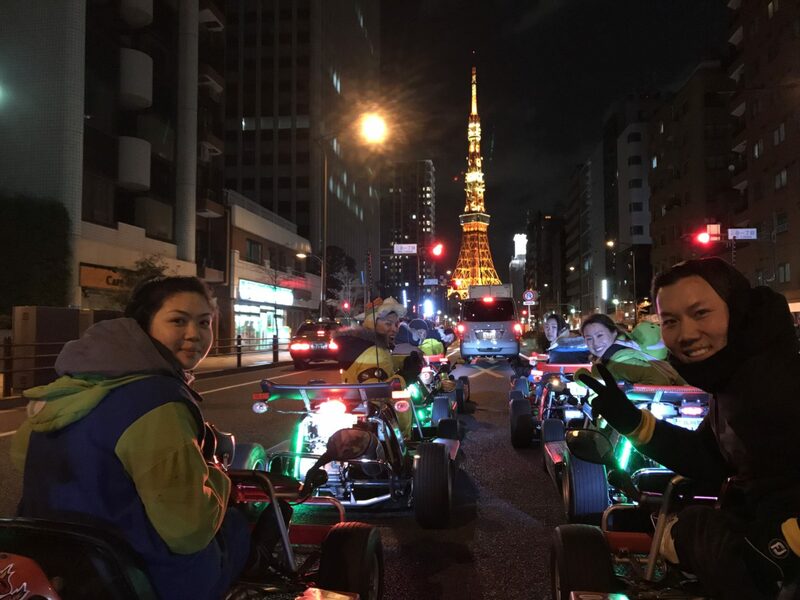 MariCAR is a tour that takes you out in a group on go-karts through the streets of Tokyo while visiting key landmarks along the way. 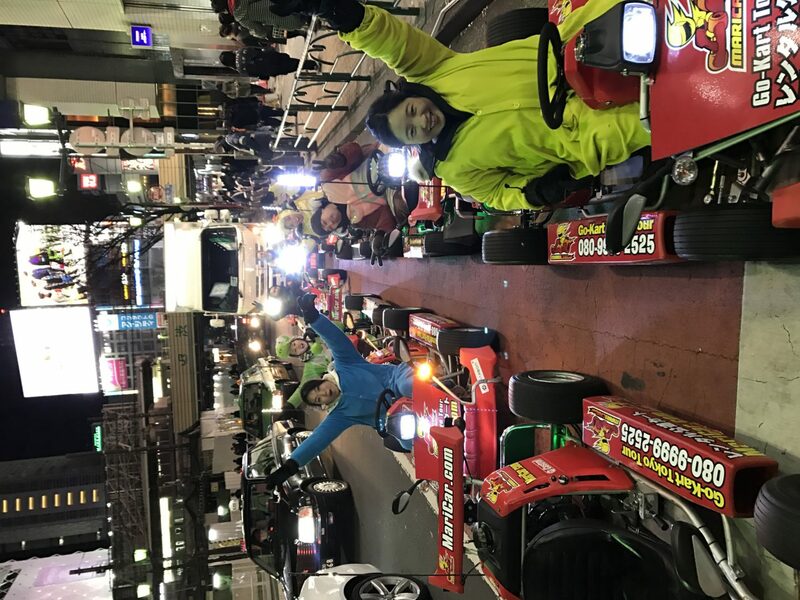 MariCAR takes a group of about 10-15 people out at a time on customized go-karts on a local tour of Tokyo. Times available vary from late morning until late night, depending on what you’re interested in. At the time of this writing, there are 7 different MariCAR locations within Tokyo. The one that we went to is location: Shinagawa #1. Visit MariCAR’s website for more information and to view the routes that all of their different locations offer. You can get a discounted price on the tour you choose if you write a review (I wish I wrote this review sooner). The price you pay includes the go-kart rental, tour guide, gas, costume rental, accident insurance, consumption tax, and photo-shooting by the tour guide. My friends and I took the evening tour, which started just after sundown. 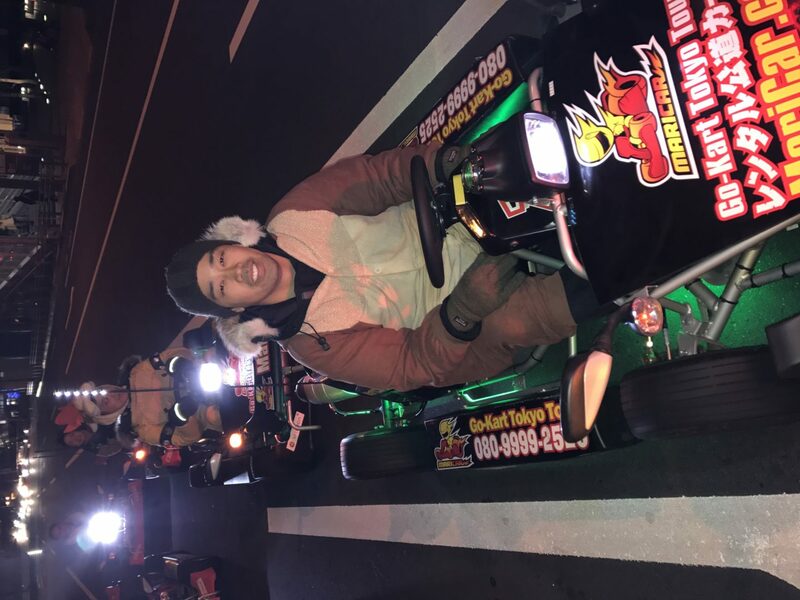 Although you might think it’s unsafe to ride around the streets of Tokyo in go-karts at night-time, it actually felt quite safe. 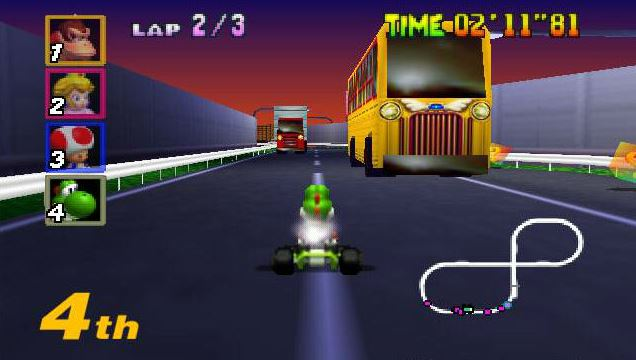 At times, I do admit it felt like I was driving Toad’s Turnpike in Mario Kart with what felt like towering vehicles right beside us on the highway. Still, drivers were very cautious around us and with the guidance of the tour guide, we all felt incredibly safe during the majority of the tour. 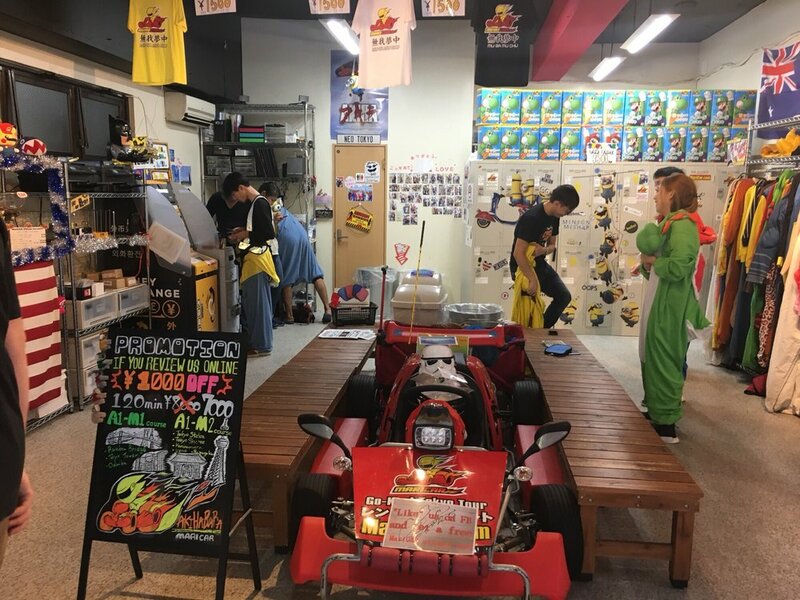 Before heading out on those go-karts, you go on over to their shop and get checked-in. After checking in, MariCAR provides you with paperwork to fill out and then asks you to provide your passport and international driver’s permit. For tourists, an international driver’s permit is required in order to participate. If you happen to have a Japanese driver’s license, (military issued) SOFA license for US Forces Japan, or a Japanese-translated license from certain countries, you are good. The international driver’s permit acts as a translation of your driver’s license from your home country. 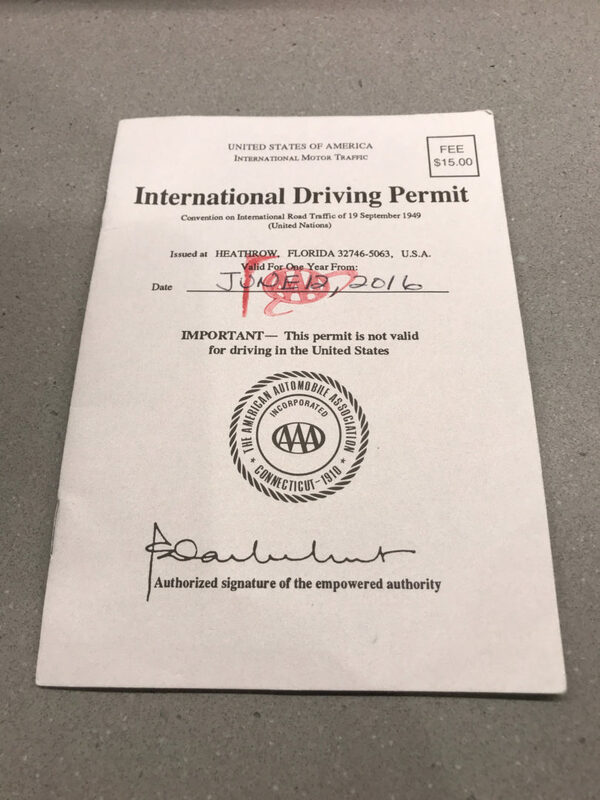 Those visiting from the United States, an international driver’s permit is pretty easy to obtain. You either apply through the American Automobile Association (AAA) or the American Automobile Touring Alliance (AATA). Most apply through AAA as it is quick and easy to do; local AAA offices were located all around me. You just need to fill out and turn in an application, present your U.S.-issued driver’s license, 2 passport-sized photos of yourself, and pay the applicable permit fee ($20 through AAA at the time of this post). The U.S. international driver’s permit is good for up to one year with the opportunity to renew as needed. AAA worked out wonderfully for me. I was able to walk in and out with a permit in hand within 30 minutes. I did this when I first got my permit for driving in Spain many years ago, and when I renewed it for MariCAR in Japan recently. Both times, I was in and out quickly– a nice contrast from what you might experience when going to the DMV. 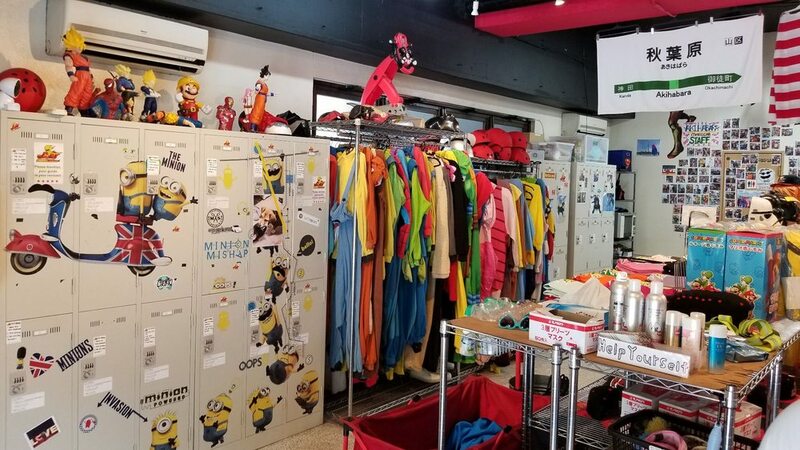 After selecting your costume from the large selection of outfits and sizes offered, you put it on and put your belongings away in lockers. You are then introduced to your tour guide. Finally, you go outside to the waiting area where the go-karts are staged. Next, you get into your go-kart and are introduced to the operations of the kart you’ll be driving. For the most part, everything is pretty simple— kill switch, seat adjustment, gas, brake, etc. The guide gives you instruction for everything you’ll need on your trip. They’ll also give you an itinerary for your trip to give you an idea of what to expect. MariCAR’s go-karts are gas-powered air-cooled two-stroke 49.3cc motors. The first time you put your foot down on the accelerator, it may seem quick. Of course, we’re talking 50cc’s here… it’s really not that fast. Keep in mind though, the purpose of this experience is enjoy the sights and sounds in the open atmosphere of the hustle and bustle of Tokyo. 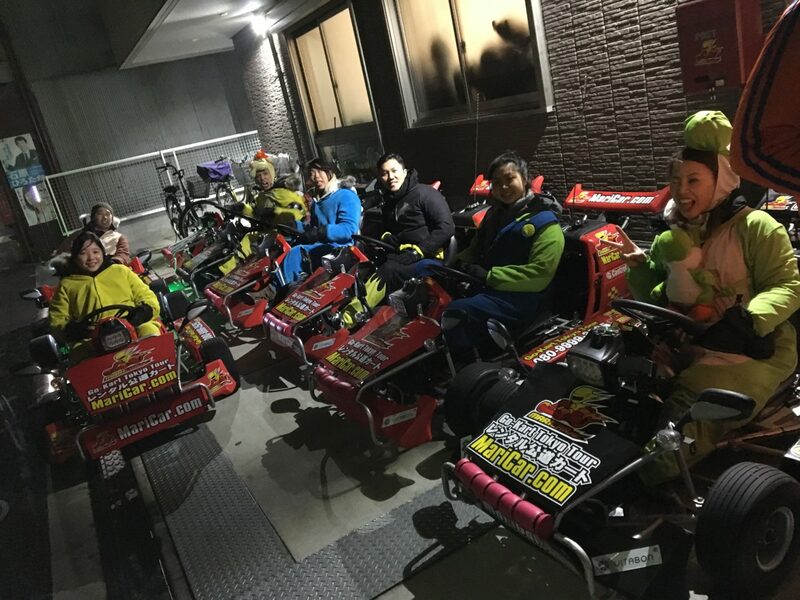 Imagine if these go-karts were little race cars; the tour group would be constantly split up because of some speed demons who couldn’t contain their need for speed. Plus, that just can’t be very safe. Fun, but not safe. On our particular trip, we did several drives through Shibuya Crossing. If you’re not familiar with Shibuya Crossing, it is one of the busiest intersections in the world. All vehicular traffic is stopped for about 90 seconds at a time with about 2500 pedestrians cross every which way during that short duration. We were able to time our stop to be at the crossing so that we could get out and snap a ton of photos right in the middle of the crossing. Even strangers came up and took photos with us, it was definitely a crazy fun experience. After the Shibuya Crossing, we hit up Tokyo Tower which is lit up nicely at night time. 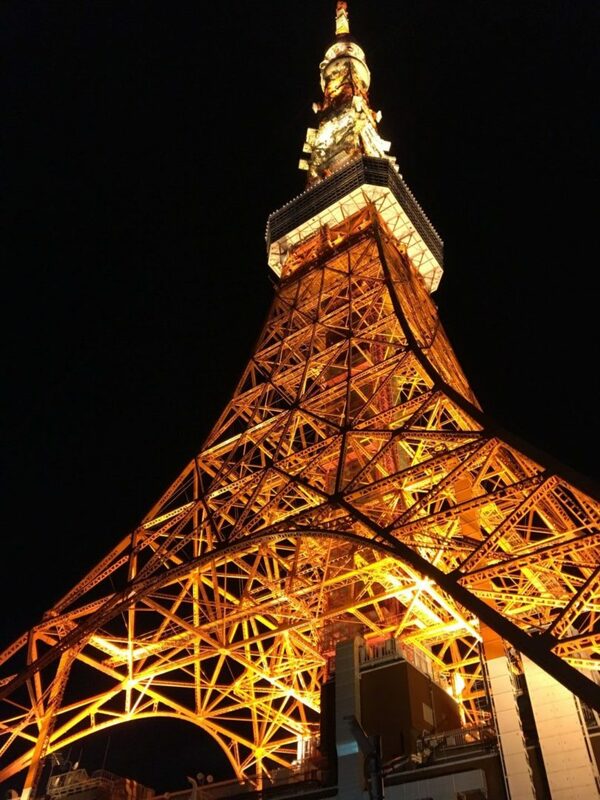 We were able to park our go-karts, head in to use the lavatories, and take even more photos in front of Tokyo Tower. 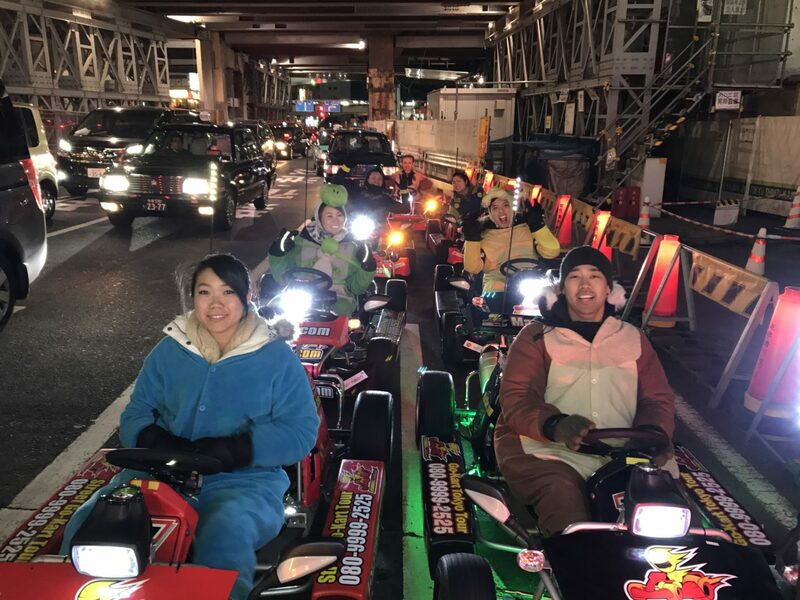 You may want to opt for the masks that MariCAR provides; during the whole trip, you will be breathing in lots of exhaust fumes from both the go-karts and from vehicles on the highway. You’ll probably notice the smell during most of the trip especially the smell of the go-kart exhaust. If you’re looking to get some good photos, you’ll probably take the tour while the sun is still out. Even better if you can time it during Golden Hour, you could potentially get some amazing shots from your ride. However, night time riding has its own uniqueness that can’t be duplicated during the day time. Just know your photos won’t come out as good as the ones that are taken when there’s more light. During warmer months, wearing the costumes are not that bad especially since you’re exposed to wind blowing in your face during your ride. Cooler months can be quite chilly especially while riding at night. The costume’s extra insulation of the costume can keep you quite warm and toasty. A face mask, gloves, and beanie goes a long way in the cold too. Thank you to our wonderful guides Ryan (far left) and Wade (being carried) for this awesome experience. They kept the ride exciting and most important of all they kept us safe throughout the tour. This was definitely one of the highlights of our trip to Japan and one that will not be forgotten. If you’re interested in MariCAR, visit their website for more information. They are very responsive and can answer any questions you might have. Each MariCAR location offers location-specific routes, so take a look at the different shops on their site if you’re interested in any particular routes/landmarks.